AP SA1 Blue Print Subject wise Download, Summative 1 Objective Type Question Paper Pattern For 8th,9th Class Objective Type Question Paper for 8th,9th class in AP State. AP SA 1 Telugu, Hindi, English, Mathematics (Maths), Physical Sciences(PS), Biological Sciences (BS/Biology/ NS), Social Studies (Social/SS) Blue Print, Objective Type Question Paper Pattern For 8th, 9th Class Students in Andhra Pradesh State. 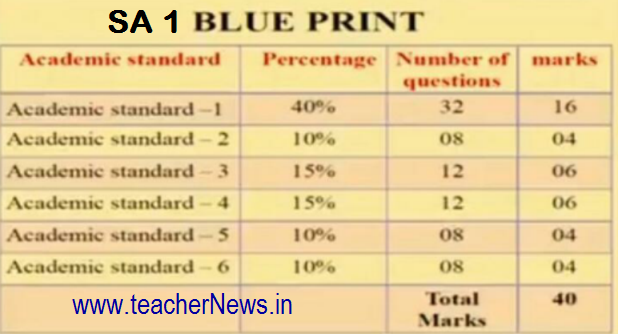 AP SA 1/ Summative 1 Blueprint ( Exam Pattern) Objective Type Question Paper for 8th, 9th class Subject wise Blueprint, Model question Papers Download here. AP SA 1 Telugu Blueprint and Exam Pattern, Hindi, English, How to Prepare Summative Assessment 1 Objective Question Papers of Mathematics(Maths), Physical Sciences(PS), Biological Science (Biology),Social Studies Blue Print, Objective Type Question Paper Pattern For 8th,9th Class Students. AP SA 1 Guidelines, Reforms of Objective Exams 2017-18 as per RC 3, AP School Education Department introduced to objective questions for 8th Class and 9th Class Students. SA 1 Exams Start form 15-12-2017 to 22-12-2017 for Primary, UP, High School Classes. AP SCERT Conduct one Day Orientation Training (Teleconference) for Subject Teachers about CCE Method Academic Standards for Objective Type (Mode) Question Papers Preparation of Telugu, Hindi, English, Maths, Physical Science, Biology, Social. AP SA1 Blue Prints, Objective Type Question Paper Pattern For 8th,9th Students, Download Subject Wise Blue Prints as Per CCE Academic Standards for SA1 Exams. SA 1 Blueprint, Objective Model Question Papers of Telugu, Hindi, English, Maths, Physical Science, Biology, Social Subject Exam Pattern for 8th, 9th Class Students in AP.